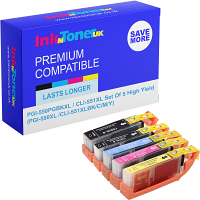 Home Ink Cartridge News Black Friday Offers! Today products across the world are having their prices slashed, meaning you’ll be able to get the products you want for cheaper. For one day only, you can get 12% off all compatible ink or toner cartridges, and 5% off all original ink or toner cartridges. Simply enter the code BF1 for compatibles, and BF2 for originals and voila! These incredible offers are for one day only! So make sure you take advantage and use the codes whilst the offer lasts. Save more with quantity discounts! The more you buy, the more you save! Need ink or toner cartridges to print out your Black Friday coupons, or anything really? Well here at Ink n Toner UK, we’re dedicated to providing you with the ink and toner products that you need for the most affordable price. Click here for ink cartridges and click here for toner cartridges. Make sure you enter the codes at the checkout, otherwise your discount won’t be applied. Save more with Ink n Toner UK this Black Friday!